phytomenadione (vitamin K1), and/or dried prothrombin complex (factors II, VII, IX, and X). INR greater than 8.0 with minor bleeding — stop warfarin and arrange same day admission for intravenous phytomenadione. The dose of phytomenadione may be repeated after 24 hours, if the INR is still too high.Restart warfarin when the INR is less than 5.0.
oral phytomenadione may be necessary. The dose of phytomenadione may be repeated after 24 hours, if INR still too high. Restart warfarin when INR is less than 5.0.
mg). Warfarin can be restarted when the INR less than 5.0. 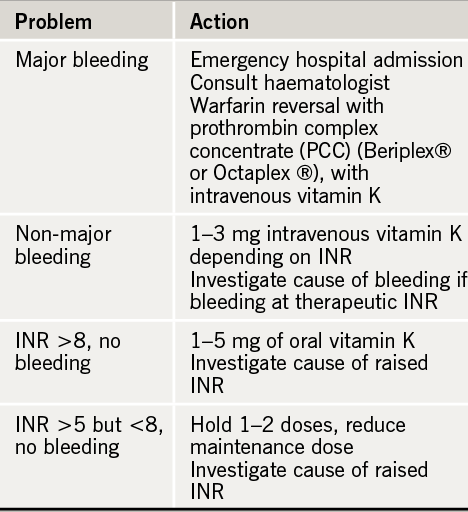 INR 5.0 – 8.0 and no bleeding — withhold 1 or 2 doses of warfarin and lower the maintenance dose. need to be omitted — the INR should then be measured 2 or 3 days later to ensure that it is falling.